Chi Burger suggested that we try The Standing Room. His good friend lived a few minutes away, and he had a great experience there. I set off for Redondo Beach and put my faith in my GPS. That was a good thing, because I would have driven by The Standing Room repeatedly, otherwise. The tiny burger joint was tucked away in a liquor store, and there was a cluster of tables outside. We arrived at the end of a Sunday lunch rush, so things were humming. The menu was a series of Hawaiian and Korean inspired dishes, and burger figured prominently. On Sundays, the menu was burgers only. That seemed like a good sign. The tiny kitchen held 4 staffers, and I happened upon a member of the staff that had close to zero knowledge about the burgers..so it goes. We ordered our burgers and fries. We took our order slips and then beverages from the various drink cases in the liquor store and paid at the front counter. We then settled in (outside) for a lengthy 20-minute wait for our burgers. I ordered the Naked burger ($7.00) and regular fries ($3.50). My meal, including soft drink came to $13.17...there was no way to tip, and, looking back, I was grateful for that. The Beef: The burger meat at The Standing Room was a mystery to the counter staffer that I interacted with. 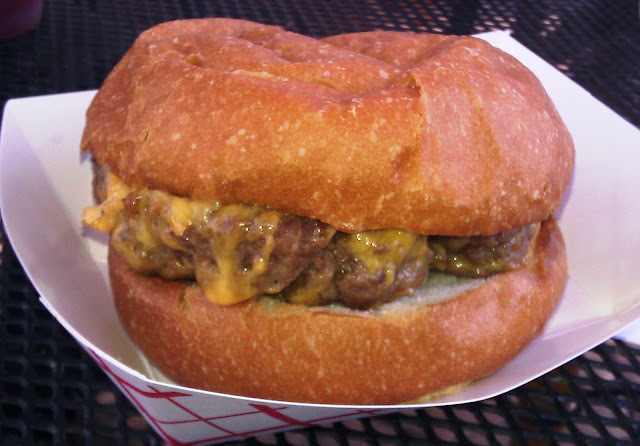 The half-pound patty was front loaded with funk. The funk was ferocious. I assumed that this was the result of dry-aging and a generous amount of Short Rib in the blend. The burger was funky to the point of having organ meat notes. While I was led to believe that the burger would arrive Med Rare, it was actually quite Well Done. Only one of our three burgers came out at Med Rare. I was not willing to wait an additional 20 minutes. The high fat content of the beef blend (25%?) kept the burger from becoming rubbery. At first I guessed the blend was Sirloin, Short Rib, and Chuck. The lack of chewiness, combined with the firm bite led me to swap out my guess of Sirloin for Brisket. The grind was medium. Aside from the heavy funk, the thick burger carried a mild beef note. The beef was good, but it would have been better had it been properly cooked. The Seasoning: My burger at The Standing Room was properly seasoned with salt and pepper. The Sear: The bottom of my burger patty had a dark sear. Sadly, that sear was not crisp. The kitchen employed both griddle weights and a metal dome. That dome steamed the burger patty to cook it faster, but that also saturated the seared layer with steam. This robbed it of texture--pity. The top of the patty was the same greyish color as the interior of my over-cooked patty. The Preparation: Sloppy. The burger was over-cooked. The burger was cooked in a way that ruined the sear. After I surveyed the tiny kitchen, I surmised that the meat was delivered pre-ground and blended. The thick, irregular patties were formed by hand and with enough pressure to keep them together but so much that the burgers became rubbery. The Cheese: Meh. The thin slice of Cheddar was an afterthought. It was not noticeable in the face of the mighty funk, heavy fat content, and buttery brioche. The cheese was a waste of calories. It brought no joy to the party in terms of flavor or texture. 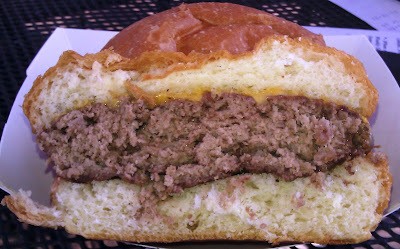 The Bun: BreadBar provided the hefty brioche that encased my cheeseburger. The bun was scarcely toasted, so the butter in the bun was too cool to provide the tender bite that the bun was designed to deliver. The bun was soft, yeasty, moderately sweet, and fresh. The bun was what we have come to expect of BreadBar, and a little more heat would have allowed the bun to truly shine. Some crispness would have been deeply appreciated--this would have compensated for the sodden sear on the beef. The Toppings: The mixed greens were at least a day past their prime. The mix clearly came from a bag, and the leaves were beginning to blacken around the edges...yuck. The Roma tomato slices were pink and on the mealy side. The Fries: The peel-off fries were crisp, well-salted, and golden. Sadly, the fryer oil was either rancid or had been used to cook fish. The oil imparted an off taste to the fries, and this was off putting after I had dropped $3.50 for potato sticks. I didn't notice any fry cutting appliance in the kitchen, so I assumed that the fries arrived frozen in bags. 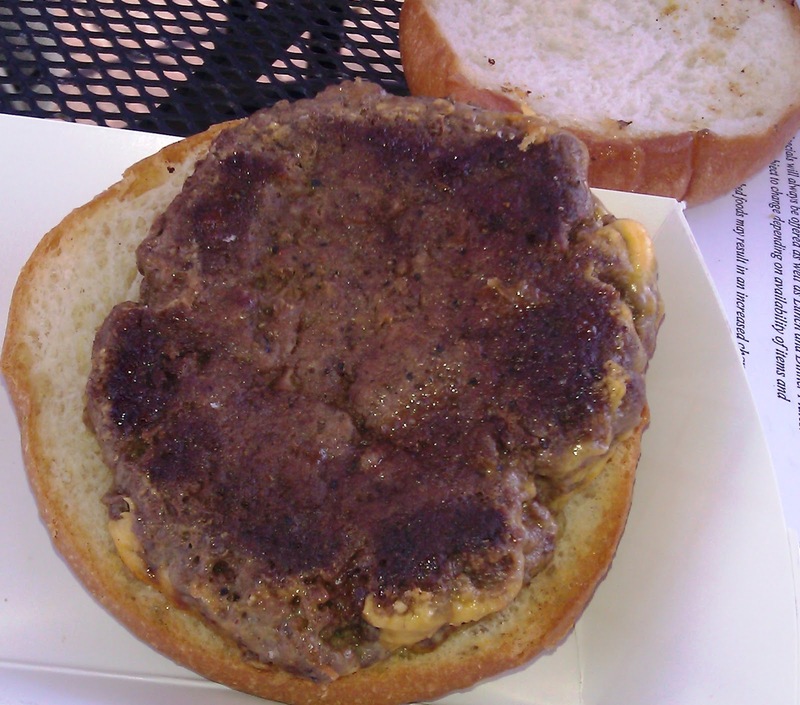 The Value: 7 bucks for a half-pound burger would have been a good value had the ingredients been treated with respect. $3.50 for fries cooked in off tasting oil was a thumb in the eye. The lack of standards in the kitchen of The Standing Room took the value down to something just below average. I was simply not interested in finishing any part of my meal. I attributed the collapse of quality at The Standing Room to a perfect storm of "end of rush" fatigue, coasting on laurels, and poor quality control. The owner/chef ducked out before our burgers left the pass. One was Med Rare; mine was Well Done: Chi Burger's was a chewy Well Done. Burger Review : Great ingredients barely kept the cheeseburger at The Standing Room from sinking beneath the waves of carelessness. Rating: 3 Bites...the 4 Bites ingredients were muted by weak preparation and a lack of standards in the kitchen. 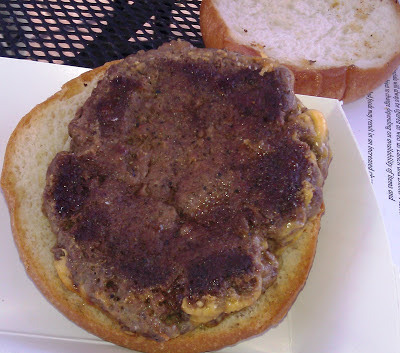 I wanted this burger to be better than it was.